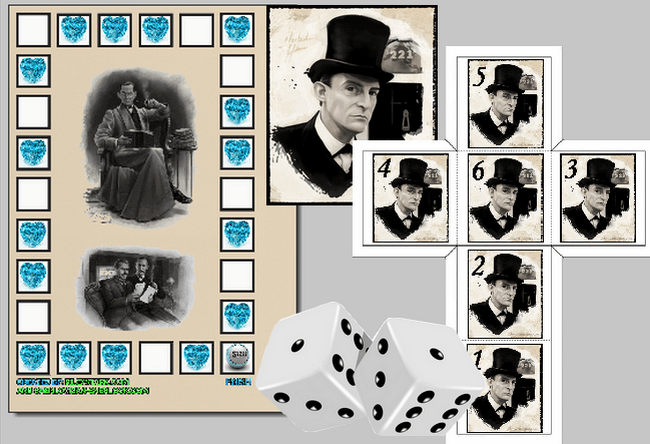 Sherlock Holmes board game - Print your own for free! Just print and play! It's free. Playing board games strengthens human relationships, it is mutual fun and joy. It enhances communication and the feeling of belonging together. Playing is a great experience. If you want to do others good, recommend this page. You can find the Share buttons on the site. The game can be played by 2-8 players. From the Start you have to go through the field six times in honour of the six Napoleons. If you step on a blue carbuncle, you pull a lucky card. You can make your game even more entertaining and funny if you create your own lucky cards. 1. You let the geese of Maggie Oakshott run away. You miss one throw. 2. You found and brushed the hat of Henry Baker before giving it back to him. You can throw again. 3. You used the door-mat before entering Baker Street 221B. This way you made Mrs. Hudson happy – step forward three fields. 4. Peterson is bored and stops you for a chat. Name five detectives from the canon to throw again or you miss two throws. 5. Breckinridge won the bet against you. Name another Granada episode which takes place at Christmas or you miss one throw. 6. You are at the Alpha Inn with your friends. You stand them a drink – go forward two fields. 7. Watson cannot remember where James Ryder works. Tell him and you can throw again. 8. The streets are so snowy that hansoms appear rarely. Till you are waiting for the next one and miss one throw, list five gemstones apart from the carbuncle. 9. The woodcock is ready. Good appetite – you miss one throw while you are eating. 10. You found the long lost pipe of Holmes. You can throw again. 11. You were engaged in a snowball battle with the Baker Street Irregulars. You miss two throws. 12. You helped Watson to build his model ship. Go forward two fields. 13. You brought Holmes some rosin for his violin. Go forward two fields. 14. Lestrade lost his pocketbook and you helped him to find it. Go forward three fields. 15. You gave a present of half a dozen handkerchiefs to Mycroft. Go forward six fields. 16. You carried home Mrs. Hudson’s basket from the market. You can throw again. 17. You bought Holmes a new Aspidistra. Go forward two fields. 18. You participated in one of Sherlock’s important and long experiments. You can throw again and duplicate your steps. 19. Sherlock defeated you in chess. You miss one throw. 20. You were in such a hurry that you almost stepped in front of a brougham. Go backwards four fields. 22. You poured vitriol on the favourite tablecloth of Mrs. Hudson. Name the story where one of her friends appears or you miss two throws. 23. You laughed at Jabez Wilson, which was not a nice thing to do. Go backwards two fields. 24. You slept through, so missed your train from Charing Cross. You miss one throw.